KTM originally began as a metalworking shop founded by Hans Trunkenpolz in 1934. As the metalworking business slowed down in post-World War II Mattighofen, Austria, the shop began manufacturing motorcycles. A short time later, Ernst Kronreif bought a large share of the business and the 20 employees began producing as many as three motorcycles per day under the brand of Kronreif & Trunkenpolz Mattighofen. KTM was born, and a rich history of success in every realm of racing has been achieved. In motocross and enduro events the KTM teams and brand have earned more podiums than any other manufacturer. In recent years, KTM has built and raced road racing motorcycles that have gone on to win championships. 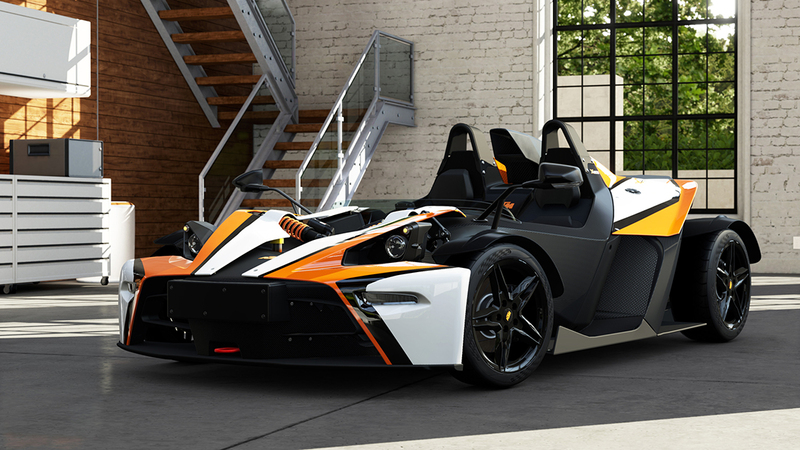 KTM’s first foray into four-wheeled vehicles was nothing less than redefining the super sports car: the KTM X-Bow. A weapon for the track, but legal for the street, the X-Bow was developed by motorcycle manufacturer KTM to be a pure performance machine. The R version brings an additional 60 horsepower to bear; to accommodate the power increase, the torque arm was lowered. A beneficial side effect of doing so was a lowered center of gravity. Add to the package stiffer springs and friction-reducing Teflon washers and the X-Bow is in its own realm of cornering ability. Deadly accuracy in the turns combined with bullet-fast acceleration have made the X-Bow a choice car for the Race of Champions but, for any mere mortal driver, it has more ability than most will ever tap. This means it is a perfect car for pushing your driving limits. Powered by a 2.0 liter Audi four-cylinder and available solely as a six-speed manual, the X-Bow requires nothing more than a driver to begin hunting for incredible track times.